Concrete has always been a part of the Driskell family, and in the late 1980’s, Gerry Driskell knew that she needed to do something to set her family business apart from the increasingly competitive market of concrete flatwork. 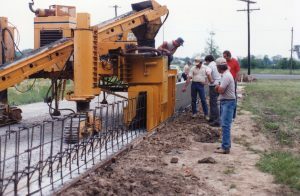 After purchasing a used Gomaco paver and Missouri Safety Barrier Curb mold, a test pour was completed in May of 1990 at the location of Gerdan Slipforming’s current office with state officials present to witness slipforming bridge walls that were typically hand formed. The test pour went well, and that day we received approval from MoDOT to slipform bridge walls on their projects across the state. Gerdan Slipforming, Inc. was then officially incorporated on June 1, 1990 with Gerry Driskell as the sole owner. That successful test pour was recorded, and shortly after Gerdan was incorporated, Gerry rented a 13” TV/VCR combo and sent Dan Driskell on the road to meet with contractors across the state of Missouri. That first road trip proved to be a success because, in the first week of meetings, Gerdan Slipforming received more than 10 contracts. Early on in our history, we remained a smaller slipforming subcontractor that typically provided general contractors with our operator, a ground man, and one additional laborer, along with our equipment to slipform bridge walls. While this proved to be successful, over time our customers shared with us their desire for Gerdan Slipforming to consider providing a completely turnkey operation. This desire from our customers has evolved Gerdan Slipforming into a subcontractor that now has more than 70 employees during peak season, and we now have the capabilities to slipform bridge parapet, barrier walls, footings, curb and gutter, sidewalks, and ditch paving. We also are able to supply and tie our own reinforcing steel and utilize our carpenter crew to hand form and pour any items that do not allow for slipforming. We have seen our fleet of specialized equipment increase from the one used Gomaco paver and one mold back in 1990, to a fleet that includes four Gomaco GT-3600s, two Gomaco Commander III four-track pavers, one Gomaco GT-6300 three-track paver, one Gomaco GT-4400 four-track paver, a Gomaco RTP-500 material placer, two customized International trucks capable of sawcutting any of our barrier wall and bridge parapet items, and more than one hundred and five molds with various profiles to fit the needs of virtually any project we encounter. Today, Gerdan Slipforming is a certified Disadvantaged Business Enterprise (DBE) in the states of Missouri, Arkansas, and Texas, and we also complete work in Kansas, Oklahoma, and Louisiana. We pride ourselves on our quality of work, which is at our foundation and is a part of our company mission statement “to provide our contractors with a quality product at a fair price.” We believe our emphasis on quality has been a large part of how we have maintained a repeat customer base of over 97%. For more than 27 years Gerdan Slipforming has continued to grow, and we will strive to continue to pave the way in quality, production, and innovative ideas in the slipforming industry for generations to come.